Excuse me while I high five myself over here - It's only November 20th and our holiday cards are ordered, stuffed, stamped and ready to go just after Thanksgiving. How about you? What are you waiting for! 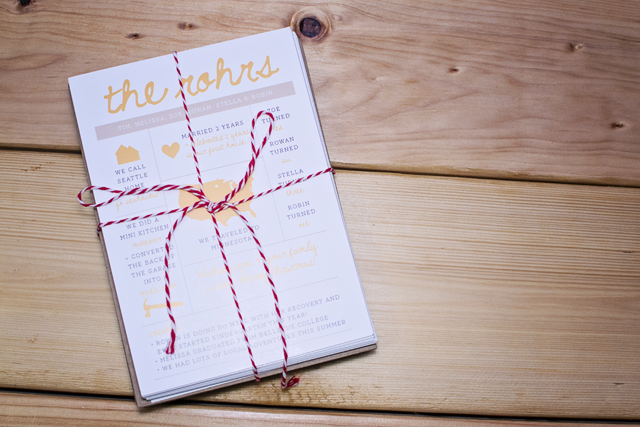 I am picky when it comes to anything design and even pickier when we are talking about something that is going out all over the country representing our family's year in review. 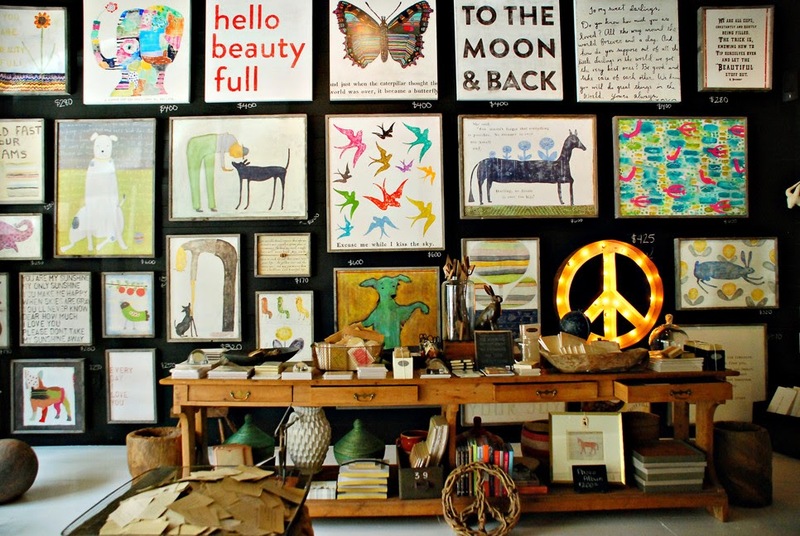 It needs to be original, different, and portray our style. This year I went to Etsy in hopes of finding something I couldn't live without at a price that fit our budget comfortably. I immediately was drawn to Graphique Bazaar and all of Sara's designs. They were new, fresh, and relatable - Her prices also couldn't be beat. It was a pleasure to work with Sara - Communicating back and forth on what I wanted on our card was a breeze and I might have literally done a jig when she sent me my proof (just a few hours later!). It was perfection and more amazing then I had even anticipated. 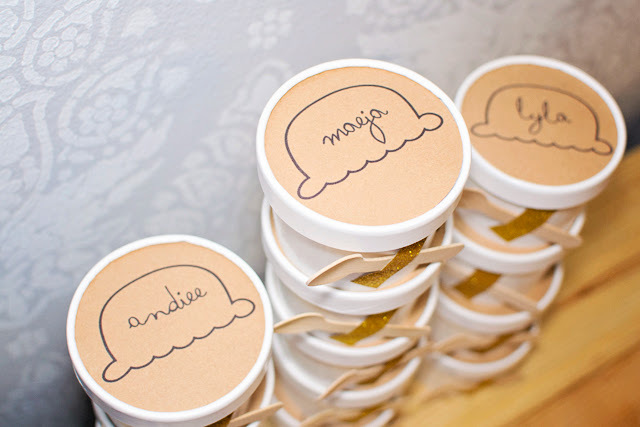 This girl is a font and clipart genius! I like the idea of opting for a non photo card this year. I know a lot of our midwest family is itching for a current photo so I choose to add some 4x6 prints from our most recent family shoot with Lulabell Photography. 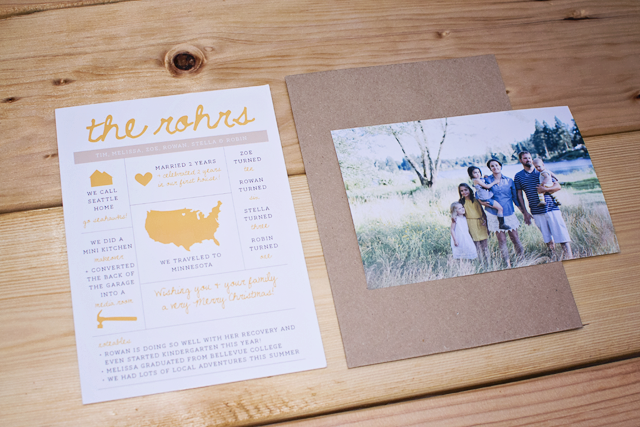 This way our info graphic style card is the star of the show and our friends and family can get caught up. I choose important tidbits from our year and even got ahead of myself on a couple since once they go out it will all be true, ha. Oh and I made sure to throw a "Go Seahawks!" on there to keep it real. I love the way that Sara runs Graphique Bazaar - You can choose from several ways to order your cards that fit all needs and budgets. Our card for example can be digitally downloaded and printed by you for $20 or, among a few other ways, can be ordered for $0.92/each and that includes the envelope and free shipping to you! Say it with me…"w-o-w!" 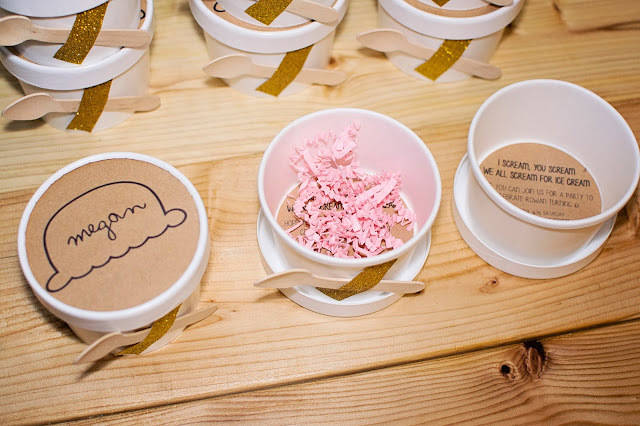 The awesomeness doesn't stop there, Graphique Bazaar also creates gorgeous tassel garlands and made-to-order letter garlands, custom envelope stamps and more. It's your one stop holiday shop this year! We are so so in love with our cards this year that we have teamed up with Graphique Bazaar to give one of my readers a $50 credit to spend on holiday cards! Entering is easy, just follow the Rafflecopter prompts below - Good luck and have fun! Disclosure: I was provided my holiday cards as a gift from Graphique Bazaar. 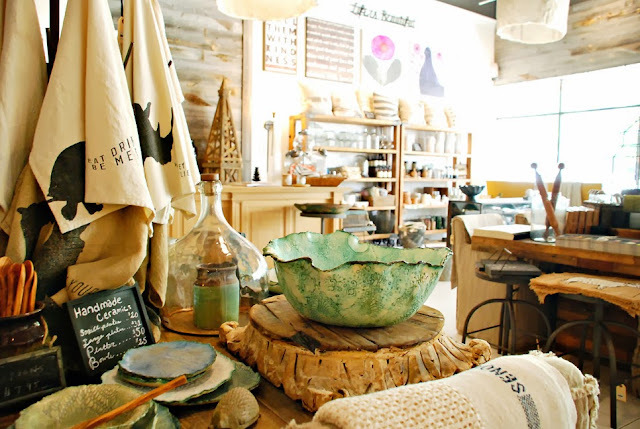 All texts and opinions are my own as we truly love this shop and its products. Congrats to Lindsay Joly on winning the itti kid giveaway! Since I was pregnant with Zoe I have committed to creating (or having help creating) a blanket for each of my little ones. Zoe and Rowan both have crocheted blankets and with Stella I tried my hand at a little fray quilt. When I was pregnant with Robin and Pinterest was now in play it was overwhelming narrowing down what I wanted to do for him. 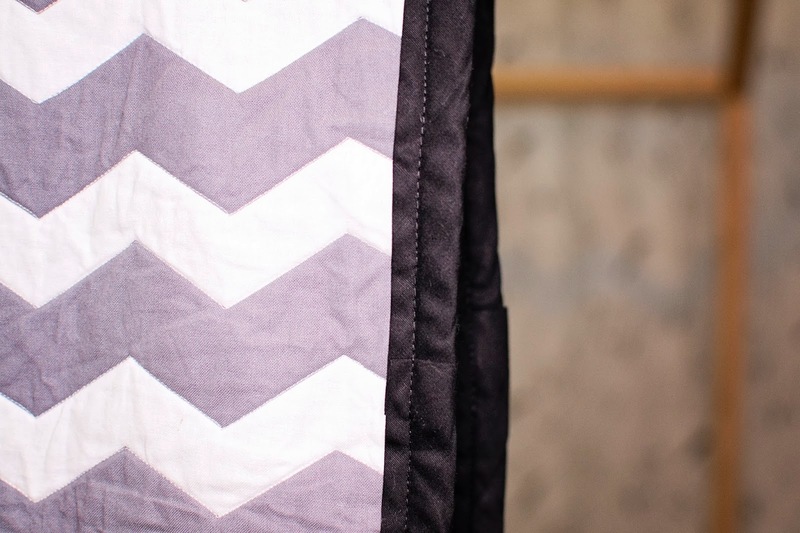 The thought of a real quilt was overwhelming to me but I finally settled on this simple tutorial I had found on creating your own chevron chenille quilt. I didn't necessarily want the same look but the idea of creating the quilting by sewing along the chevron pattern was fascinating for me so I went for it. I picked up two yards of a soft thick fleece and my favorite color of a bold chevron fabric (I know, chevron is sooo over). After washing I pinned the two piece together and got to work "quilting" along the chevron. This is is where I realized what a task I was in for. I am not overly skilled at sewing with my machine so I had to go slow and in the process my eyes and back and hands got tired very quickly. I was lucky if I could do five rows in a sitting. PS, I was stills king a terrible job of staying on the lines anyway. Long story short I started this little quilt when I was about six months pregnant and just finished it two months ago. When I was done with the quilting I laid it out and trimmed the sides evenly to prepare it for binding. I went with a simple ready made quilt binding and with some help from my mom added a fun folded look as it was put on. I opted to not layer several fleece and flannel to create the chenille look but instead was just in love with how the quilting looked. The blanket washes great and Robin loves it - he always pulls it over when we tuck him in at night. It was a fun but very time consuming project - Still so in love with it though! 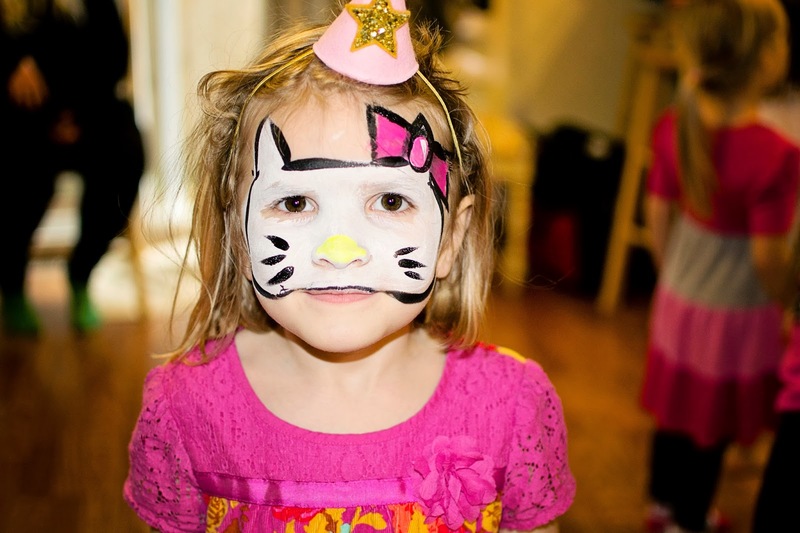 Rowan turned six on Thursday and on Saturday we threw her dream party - Because when your five and a half and you have to spend a month in a hospital with a life threatening disease, you get whatever you want. Rowan has overcome so much the last six months that she deserved it all! And you guys, I threw a party and remembered to take photos! 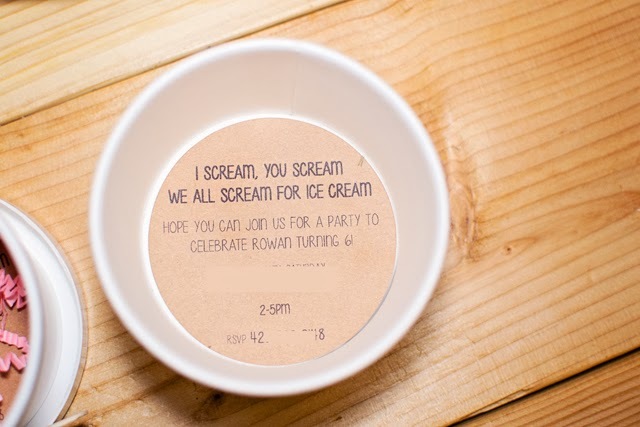 We had been discussing a ice cream party for awhile now and it was so fun working with Rowan to put it all together. I tried to stay away from Pinterest as much as possible and just sort of let it unfold based off of things she liked and different things I saw here and there that I wanted to incorporate. 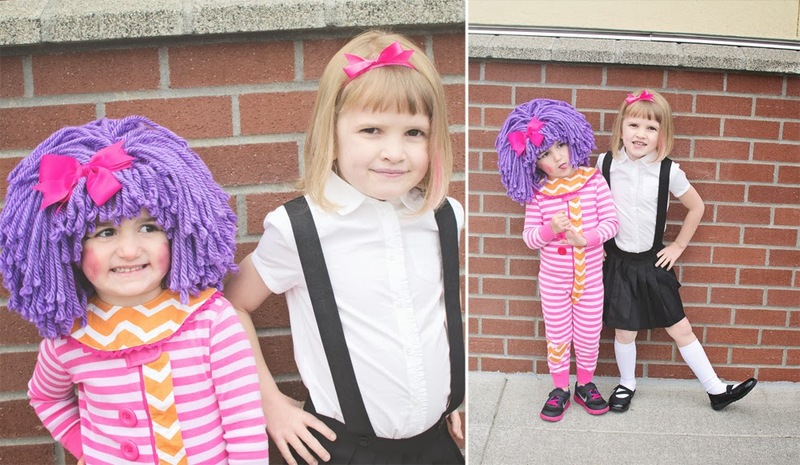 She handed out the most fabulous one-of-a-kind invites to all of the girls in her class along with some of her best friends from preschool. She really has some great friends this year and they all got along so well. I tried to keep the "look" simple and stuck to just decorating the table - it's too overwhelming trying to cover the whole party area and usually more money then I want to spend. I ordered a roll of chalkboard contact paper and a white chalk pen so that I could create a fun table runner. I doodled and labeled until most of the roll was covered then placed all of the table items accordingly. 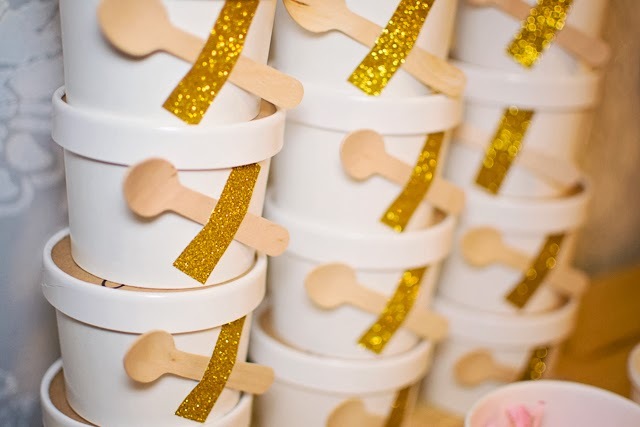 Since it was a ice cream party we did eight different topping, three syrups, and three cone/bowl choices. I didn't expect so many would choose a cone over a bowl so a lot of the toppings didn't stay on too well, oops! For over the table I had so much fun creating the paper chain chandelier. I forgot how much work paper chains were and after weeks of working on a just a couple strands I broke out my glue gun and was able to finish in one night (I was using Elmer's before). I just used two packs of card stock from Michaels in colors Rowan chose and using my paper cutter sliced out each color in different lengths and widths. It turned out so cool we decided that I will rehang it in the girls room after we're done enjoying it over the kitchen table. As usual our most awesome cake lady Denise made my vision a reality, in fact blew it out of the water. 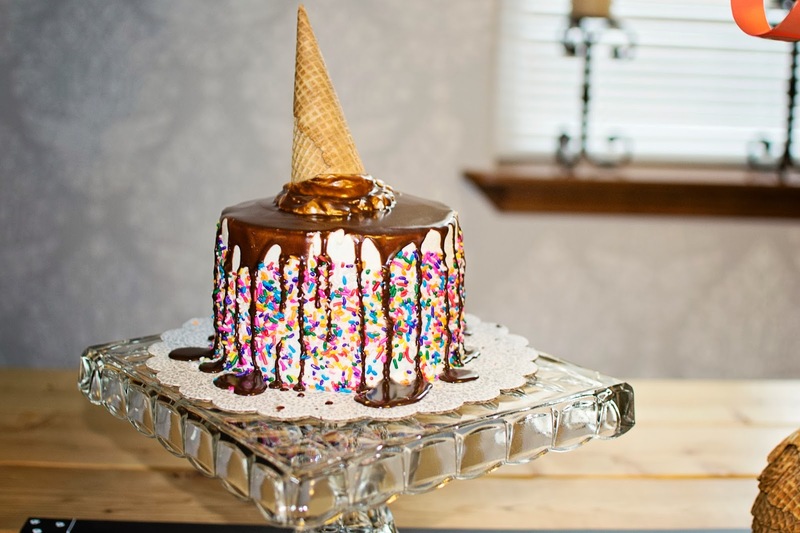 She always create the most one of a kind cakes for my kids, I would be sad if the tradition of hiring her ever stopped. She isn't even an official pastry chef - We were introduced through my good friend and she has been creating our cakes since Stella's first birthday. We surprised Rowan with a face painter, who was actually a gift from our good friends Dylan and Amy. It was such a wonderful treat and a much better option then cheap favors if you ask me. There wasn't a request she turned down and she was happy to oblige four hello kitties even. I even got my face painted - How could I not? Rowan ended the day telling me this was the best birthday she has ever had and was all smiles from ear to ear. I don't do big parties like this often but it is sure fun when we do! Let's get real for a second - Rowan has got to be one of the most difficult kids on the planet to shop for. All trips to Target consist of a lot of pleading to visit the toy aisle and a long list of wants needs and must have right nows but when it comes down to it she is never interested in any of that stuff once we get it home. Art supplies seem to be the one exception, this girl could create until the sun goes down. In fact she does and right when the sun comes up too, she is constantly begging for one more minute as the bus is actually pulling up so that she can whip out one more doodle for her friends. With Rowan's birthday this last week I jumped at the opportunity to work with RoseArt's new Extreme Air Brush Studio. It was the perfect thing to surprise her with and once her party wrapped up on Saturday she couldn't wait to get right to work. A fun new media she had never tried before, graffiti art! We had so much fun creating together, Rowan and Stella did a great job taking turns and admiring each others work. I only wish we had two so that they could work along side each other. Maybe a good gift from Santa to Stella? My personal favorite part? Rowan still struggles in the find motor department since being diagnosed with Encephalitis in May. Her little hands get tired easily and she has a hard time finishing her projects or they get sloppy towards the end which can be very frustrating for her. With the RoseArt Extreme Air Brush Studio there is very little to no "fine control" needed to work the machine or create beautiful art. It is the simple press of the button and aim to get going - as she would say, "easy peasy lemon squeezy!" 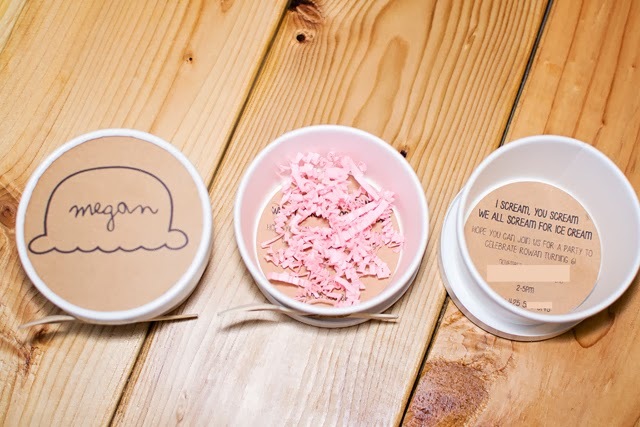 It is the perfect fun and frugal gift for the upcoming holidays. It can be found at most retailers for between $20 and $30, a budget friendly price for a wide age range. Also, make sure and stay tuned for an announcement coming from RoseArt on a amazing Black Friday deal regarding the Extreme Air Brush Studio! What is the RoseArt Extreme Air Brush Studio? RoseArt Extreme Air Brush Studio gives your child a fun and affordable new way to paint and create. 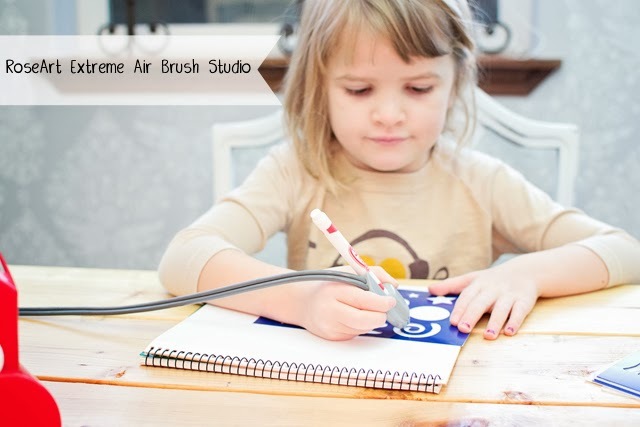 This motorized air brush kit allows kids to turn any RoseArt Super Tip Markers into paint brushes with the removable pump and sprayer. Extreme Air Brush Studio includes the Air brush Caddy, Detachable Motorized Pump, Sprayer, 15 SuperTip Markers, and 5 Chipboard Stencils Sheets. 1. Select any RoseArt SuperTip Marker and load it into the handle of the motorized sprayer. Make sure the marker is inserted all the way into the handle. Adjust the marker forward or backward slightly to achieve the desired spray pattern. RoseArt recommends experimenting with how to correctly insert the markers in the holder so that the product sprays ink optimally (not too much, not too little). 2. Select your favorite stencil and lay it on a blank sheet of paper. 3. Turn on the motorized sprayer, press the red button on the handle and spray away! 4. Be creative! You can paint stunning pictures and graphics using the included stencils or feel free to create designs all your own. The packaging suggests the RoseArt Extreme Air Brush Studio is for 6+ but Stella who is only 3 had no problems creating some of her own art, I just made sure to cover her work area really well and encourage she go slowly. Check out this video to see it in action and learn even more! RoseArt is celebrating their 90th Anniversary this year. To celebrate, they are hosting a Facebook sweepstakes where participating fans are eligible to win weekly gift cards and prize packs, as well as a $1,000 VISA gift card for holiday spending. 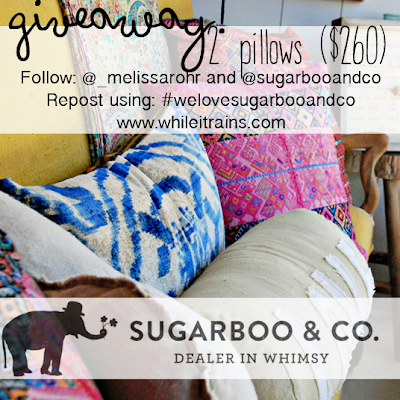 Enter on Facebook through 12/21/13. Disclosure: This post was sponsored by RoseArt but the content and opinions expressed here are all my own. 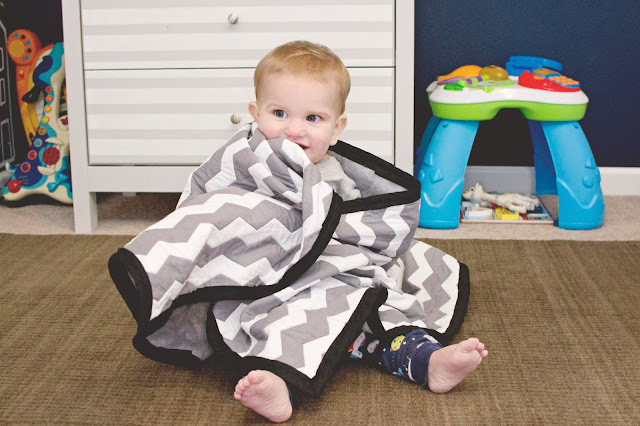 Things we love: Itti Kid + A giveaway! There is nothing that I love more than a cute baby in a romper so you can imagine my excitement when I found itti kid. They don't make just rompers but those sure are my favorite to pick out for Robin! Their rompers have got to be one of the easiest outfit choices in Robin's closet right now. Perfect for at home while we are lounging around and just as cute and stylish if we decide to go out. Comfy like pajamas Robin isn't being weighed down by heavy and uncomfortable fabrics so he gets around great. A lot of itti kid products are even organic for added peace of mind! 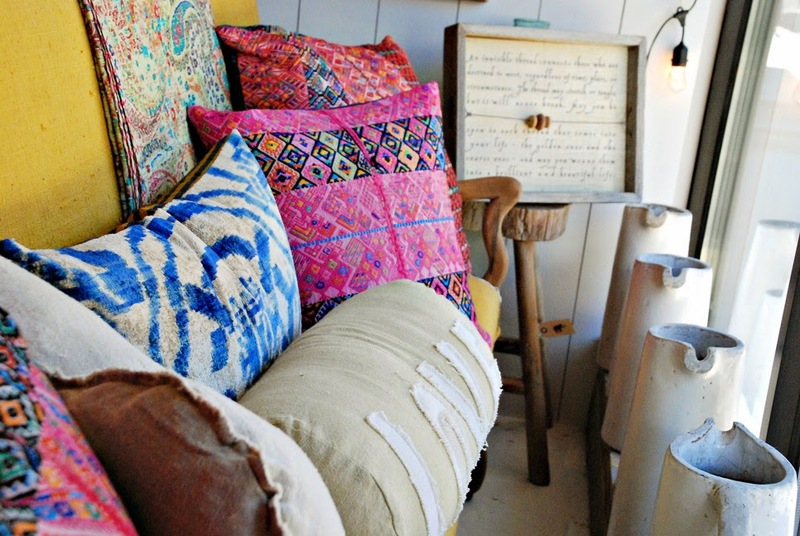 Made some soft colorful fabrics with patterns you won't find anywhere else. Everything washed great and holds up on those chubby knees learning to crawl and walk. We have several rompers from itti kid and I fully plan on keeping Robin in them till he says no - I mean can you even stand how cute those hooded playsuits are? itti kid is a Scandinavian company with items hand selected from Denmark, Sweden, and Scandinavia. Most items are gender neutral and inspire imaginative and comfortable play. I usually can' get over there great prices - Considering you are getting a piece that will last and last it is worth every penny! 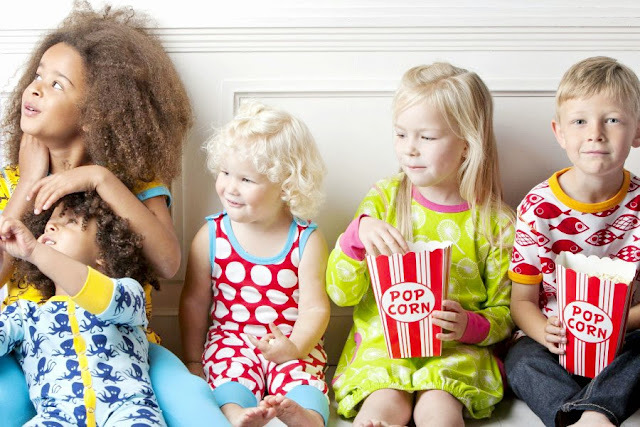 Make sure you connect with itti kid on Facebook to stay up to date on sales and discounts. *Disclosure: I was sent a itti kid romper for free but all text and opinions are my own as we have been a long time supporter of itti kid. It's finally here, I know you have all been waiting! 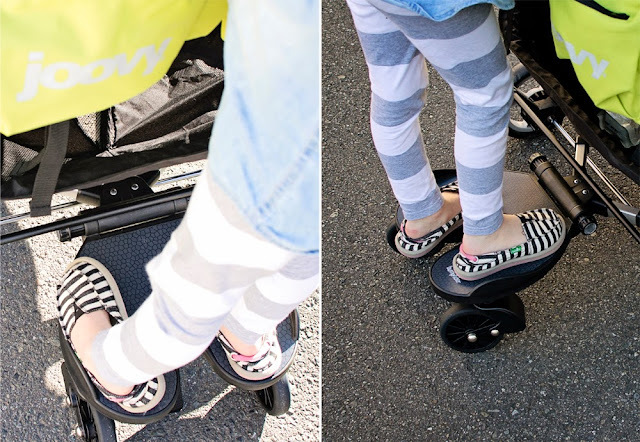 The most universal stroller board on the market and Joovy makes it! As usual Joovy is on point with trends this fall and put out their own stroller board, The Joovy Bumprider - With it's unique construction it is guaranteed to fit any stroller out there. Wow! I was so excited to receive out board in the mail, we instantly put it to use. What can I say, my kids love a good walk around the neighborhood! I was a little intimidated when I first pulled it out of the box but quickly realized it would be a snap to figure out. I only had to attach the wheels to the board and with a short guide full of pictures I had the board attached to my stroller pretty quickly. Want to hear the best part? The other day I had asked tim to load the stroller into the car, forgetting I had just parked it in the garage with the board still attached. Without any coaching from me or finding the instructions he was able to collapse, fold up, and fasten the board for transport. Go Tim! The new Bumprider comes in black or white and only adds about 4 lbs to the total weight of your stroller. The arms are adjustable for width, height, and length to fit all strollers and have quick release clamps for easy removal. The board is finished off with a no slip surface and wheel suspension for a smooth ride. 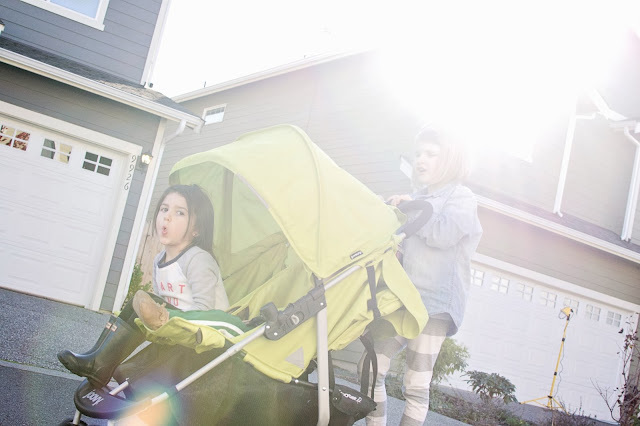 The Bumprider is made for kiddos about 2-5 or up to 45 lbs. I got no complaints from my riders the other day as they took turns on the board. 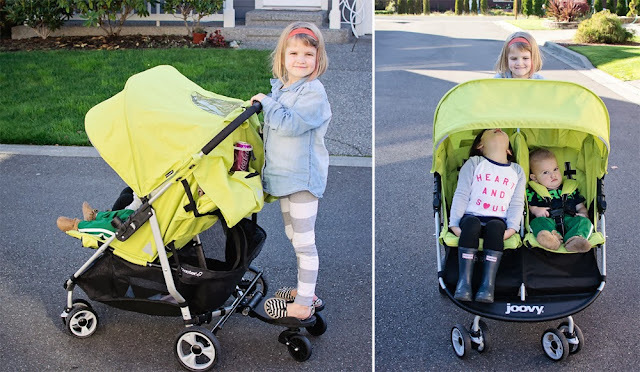 Since, we have tried it on our Chicco umbrella stroller and our jogging stroller and got the same results with both - Easy to attach and fun to use! 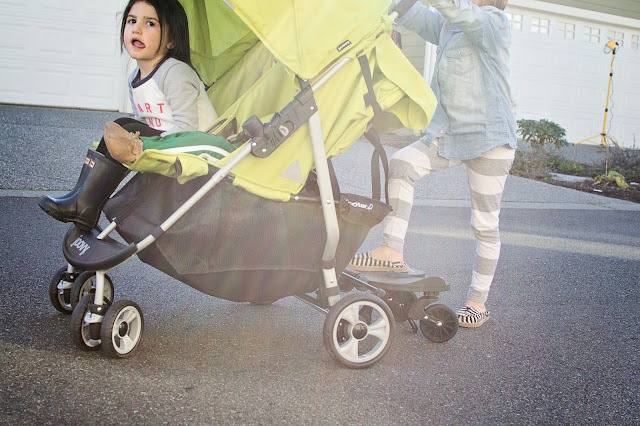 Where to buy: The Joovy Bumprider is sold in two colors for $119.99 on Joovy's website. Connect with Joovy on Facebook and Twitter for exciting news and updates! I have to say that this is one of my most favorite Halloweens to date. 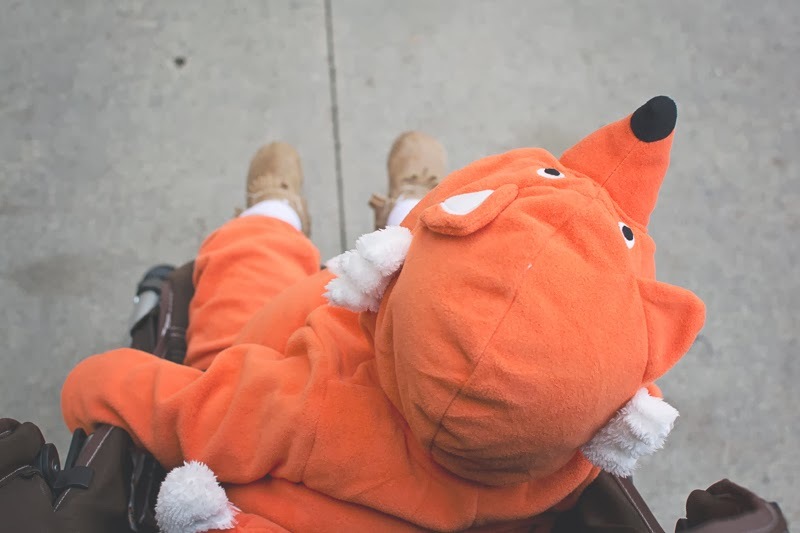 Even Robin got into trick-or-treating when we let him select his own candy from the bowl and he loved all the extra snuggles he got in his cute fox costume. 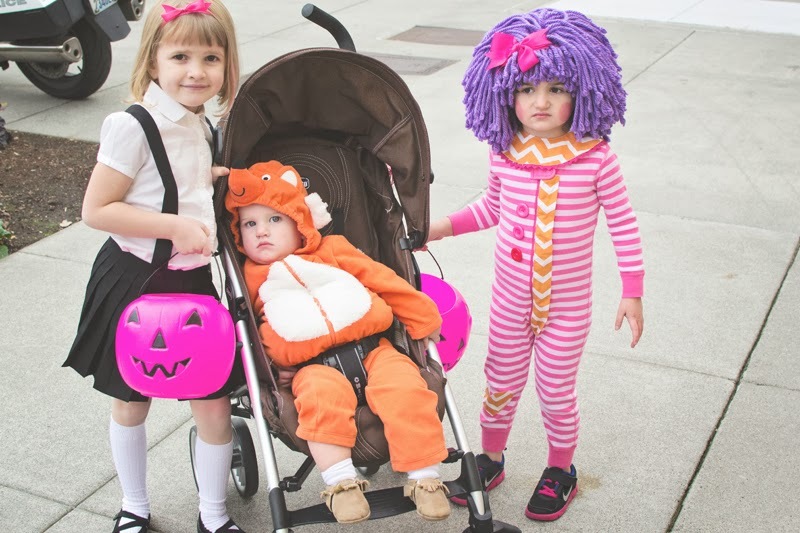 If you didn't already guess - Rowan went as the sassy Eloise from her favorite books, Stella was Pillow Featherbed Lalaloopsy and Robin was a fox. 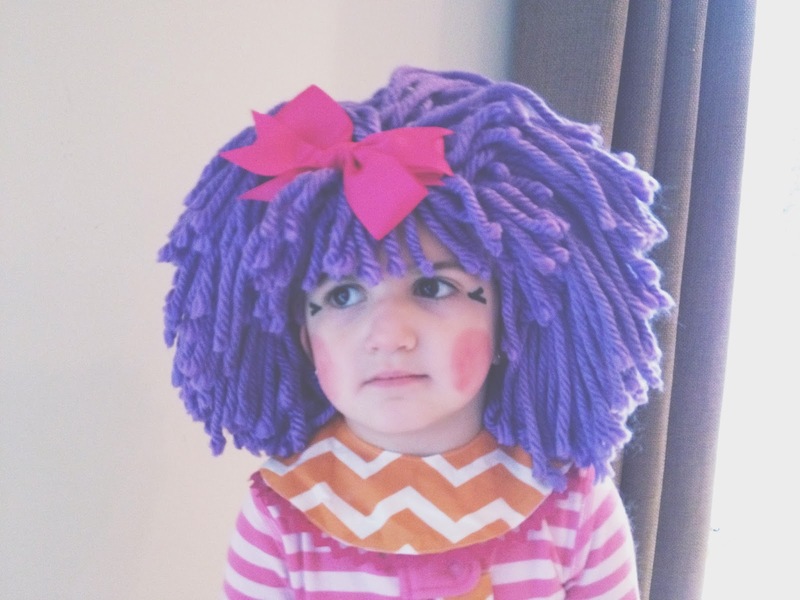 Lots of people asked Stella if she was Raggedy Ann which I couldn't really see and I think a lot of people assumed Rowan was just coming from school. Thankfully only one person asked Robin, "what does the fox say?" We started off our day with a quick stop at our friend Lennox's for cute overload and photos. 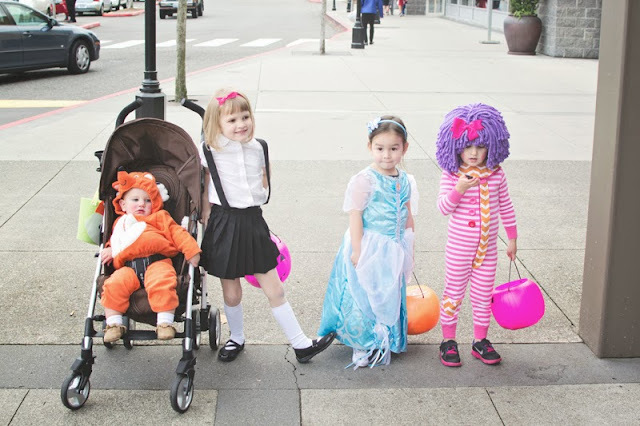 Then quickly we zipped down to Factoria to trick-or-treat at the mall and check out a Radio Disney event with the cousins. When that wound down we headed off to Tim's co-workers for yummy dinner and the official trick-or-treating of the day. This was our second year joining them, we would have last year but Robin was less then twenty-four hours old and it rained. They had three kinds of soups and chilis and the girls always love playing with the other kids that are there. Rowan raced around trying to keep up with the big kids all night and even though she had a strong start, Stella was ready for bed after just a few blocks. When we were packed back in the car heading home I asked the girls if they had fun - I was met with some groans and complaints about heavy buckets. I couldn't have rolled my eyes harder at them, ha! As usual I had so much fun dreaming up and creating their costumes with them. We enlisted Tim's aunt to help with Rowan's and my jaw dropped when it came in the mail, it was perfection. I refused to buy Stella the store version of her costume so with some Hanna Anderson pjs off Ebay and a trip to Joann's, my mom and I were able to come up with a pretty cute and realistic outfit. Thank you again to The Yumbaby Shop for sending Stella the most perfect wig to finish off her costume - it kept her head so warm on Hallwoeen!